I've been making these cute little baskets for years. 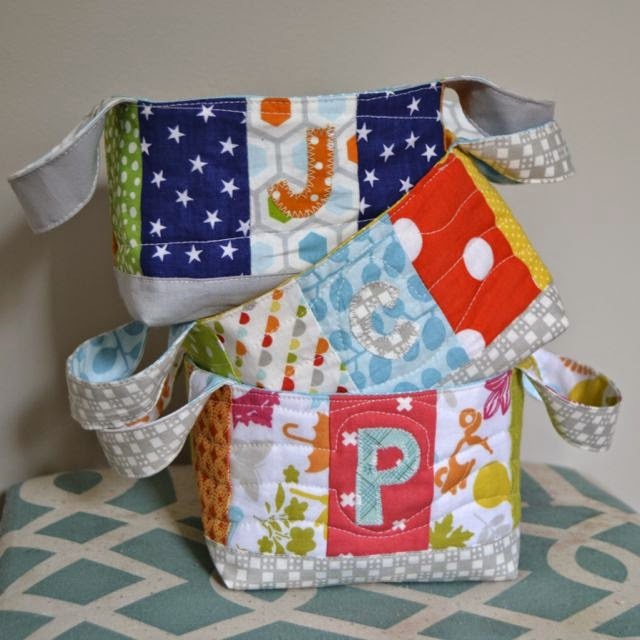 They're quick and make great gifts - fill with little books or craft supplies for a birthday gift, use Christmas fabric for the holidays, or leave them out for the Bunny to fill with chocolate and other goodies at Easter! Funny enough, as often happens with these things, my own kids have yet to receive their own baskets... I've made about ten of these as gifts or for special orders, while my daughter is the proud owner of one of my first "experimental" versions (which is kind of ugly and floppy because I was trying to figure out the best kind of interfacing to use). What is it they say about the shoemaker's children going barefoot? 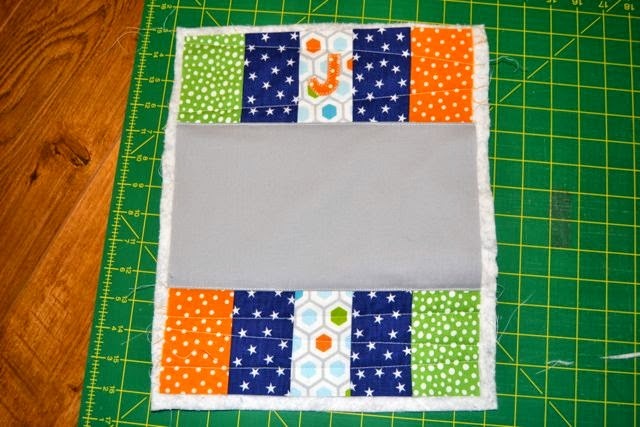 I haven't even gotten around to making my youngest daughter her baby quilt yet, but that's a whole other can of second child guilt for another time. So, let's talk baskets. 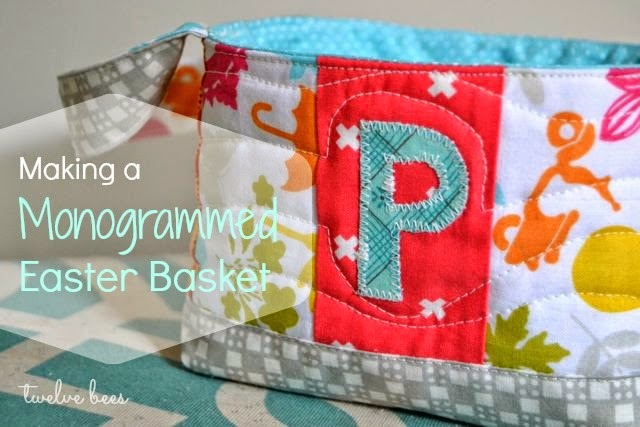 The construction of this simple basket is based on this tutorial from Pink Penguin. 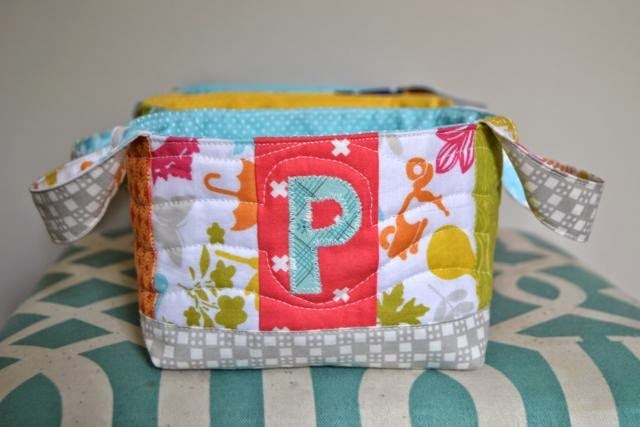 I modified the pattern to make the finished basket a bit bigger and to use patchwork strips as opposed to squares, which makes it easier to add a monogram. Every time I go to make one, I have to search for my scrawled notes, so I decided to post it here mostly so that I'll remember how for next time. I'll show you what I did differently, and then refer you to the other tutorial to finish off constructing the basket - she really explains things so well, there's no point in me duplicating it! The finished basket measures approximately 4" x 6" wide, and 4" tall. 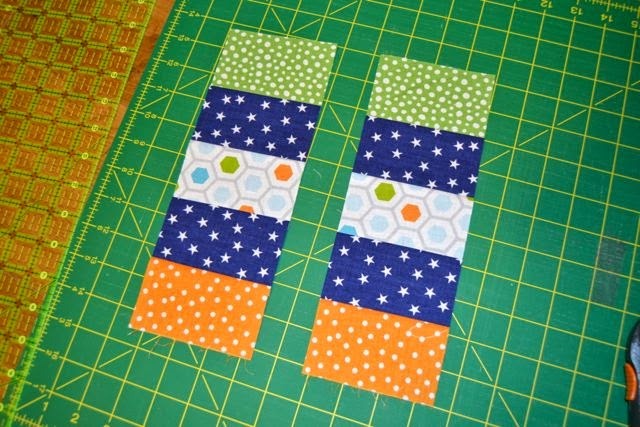 Using a 1/4" seam allowance, sew the five 2.5" x 8" strips together width-wise. Press seams to one side. 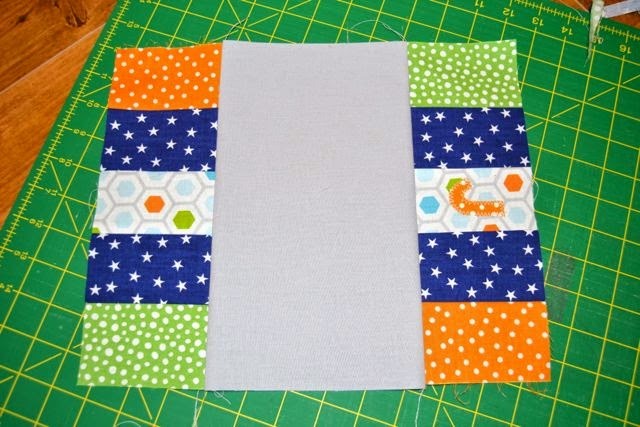 Square up and trim the length so that the finished piece measures 7.5" wide (it should be approx. 10.5" long). Slice the piece down the middle, so that you have two identical pieces each measuring 10.5" x 3.75". 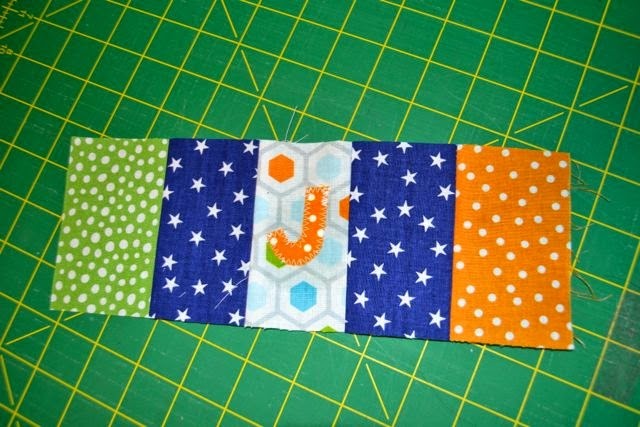 Now is the time to applique your monogram on to the centre strip of one side of the basket. I ironed a scrap of Heat'N'Bond Featherlite to a roughly 1" x 2" scrap of fabric, then drew and cut out the letter. I then ironed it on right in the middle of the strip and finished it off with a zig zag stitch around the outside of the letter. 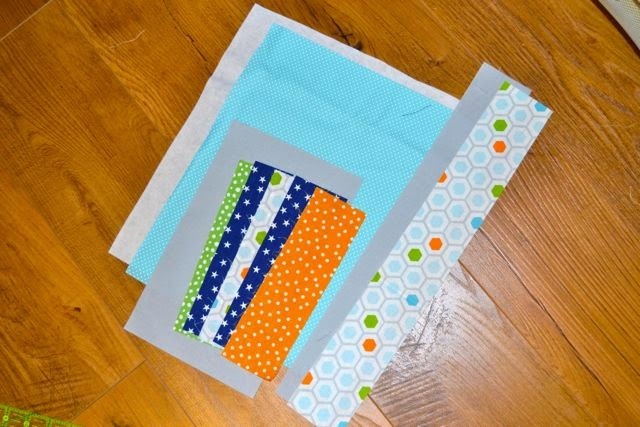 Layer the outer basket piece, batting, and heavyweight interfacing. 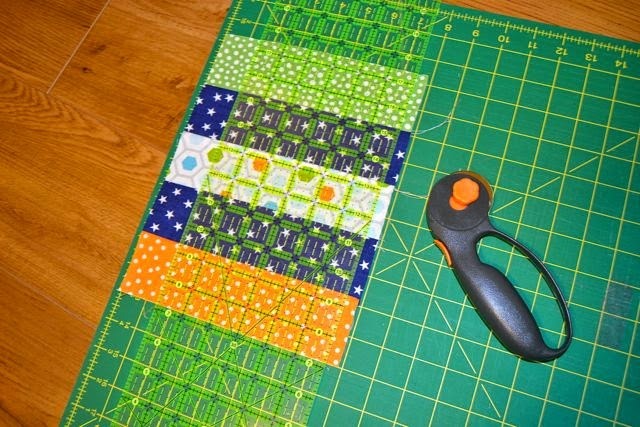 Using your walking foot, topstitch along the edges of the base just below the patchwork on either side. Then, quilt as desired along the sides. I used my walking foot to add a few wavy and diagonal lines. Trim the edges and square up the finished outer basket piece. If using my dimensions, sew the seam for the box corners 2" from the pointy edge (rather than 1 3/4", as she does). I've found it works best to cut the lining piece down to 1/4" smaller in each dimension than your outer basket piece before assembling it. E.g., if your finished outer piece measures 10.5" x 13.5", trim your lining to 10.25" x 13.25". This way it won't be baggy inside your basket. I sewed my handles as one piece and then just cut it in half to make two (she sews both separately). Fill your finished basket with delicious things and enjoy! And please, make some nice ones for your own kids before you go giving them all away to the neighbours. Or, if you must give them away... at least take some cute pictures to show me first.